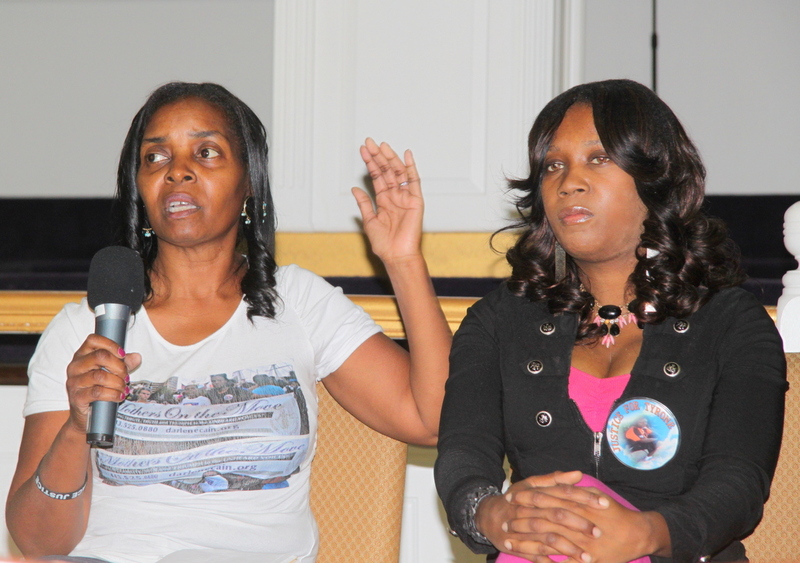 Above: At a meeting in Park Heights last October, Darlene Cain and Tawanda Jones talk about their grief after each lost a loved one in police encounters. The people who die in encounters with police in Maryland are disproportionately black and 41% of the time unarmed, according to a new report by the American Civil Liberties Union of Maryland, which also found that the police officers involved are charged in only 2% of the incidents. The report, which looks at deaths between 2010 and 2014, is less about “individual cases” and more about “the story that is almost never told – the cumulative toll of deaths in police encounters in Maryland,” according to the authors. Between 2010 and 2014, 109 people died in police encounters in Maryland – and 75, or two-thirds, were black. Maryland’s overall population, the report notes, is 29% black. Still, comments on the report by parents and other family members of victims make a stark connection between the numbers and the people. “I pray justice will be served by making new laws to hold officers accountable for their actions just as civilians have to,” said Mildred Fisher. Exactly a year ago on March 18, her 32-year-old son, Winfield Carlton Fisher III, went to the Salisbury Police Barrack to settle a ticket involving a broken rear tag light. An argument ensued, which quickly escalated and he was shot and killed by Maryland State Police after he allegedly struck and dragged an officer with his car. Another comment came from the mother of a 19-year-old man killed by Prince George’s County Police. “It nearly took my breath away when I read the report. To see it printed in black and white,” said Marion Gray-Hopkins. The data for the ACLU’s “briefing paper” come from media accounts as well as data reported by the state to U.S. Bureau of Justice Statistics and obtained through a Public Information Act request. • Five black people died at the hands of police for every white person who died when the size of the two populations were taken into account. Put another way, the rate at which blacks died in a police encounter was five times that of whites. • The number of unarmed blacks who died (36 people) exceeded the total number of all whites who died (30 people), armed or not. • Ten unarmed black people died for every unarmed white person who died, when the size of the respective populations were taken into account. Put another way, the rate at which unarmed blacks died by a police encounter was ten times that of whites. • 38% of those who died (41 people) presented in a way that suggested a possible medical or mental health issue, disability, substance use or similar issue. • 79% of those who died (86 people) were killed by police gunfire. • 21% of those who died (23 people) were not shot. In most of these cases, police used handcuffs or other restraints such as pepper spray and/or a Taser. Several individuals were killed in the course of a vehicle pursuit. 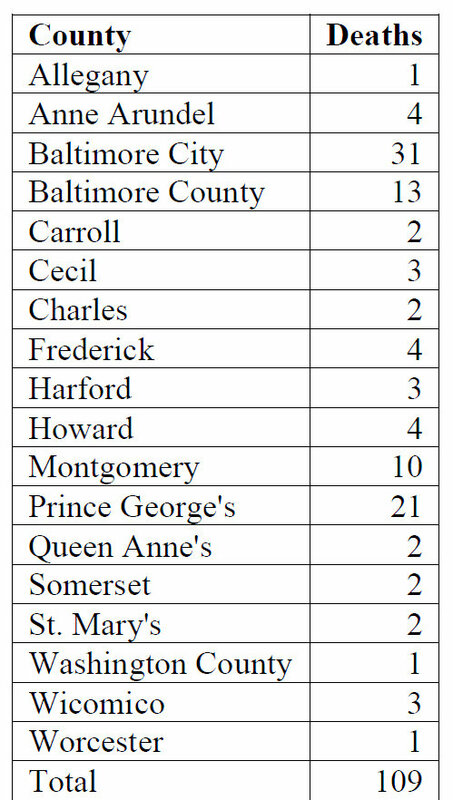 The FBI’s 2012 data on “justifiable homicides” by law enforcement (which does not include all deaths at the hands of police) lists Maryland as having the 6th highest number of homicides by police out of the 39 states reporting, according to today’s report. In releasing the report, ACLU staff attorney Sonia Kumar said the group’s purpose in documenting the problem was to take the first step toward solving it. “State leaders must act now to send a clear message to families, communities and police that all lives matter and that these deaths are not inevitable,” Kumar said.